Imagine you've acquired a long-standing scenic tourist attraction, consisting of a series of impressive show caves at the end of a lush limestone valley with a gentle river running through it, the water feeding a Victorian paper mill. What might you do to draw even more visitors in? Some extra scenic gardens, maybe? A water feature or two? Or do you haphazardly slap in a truckload of enormous, garishly coloured, hilariously dated dinosaur models and a pirate-themed crazy golf course? If you're 'circus entrepreneur' Gerry Cottle, there can only be one choice. 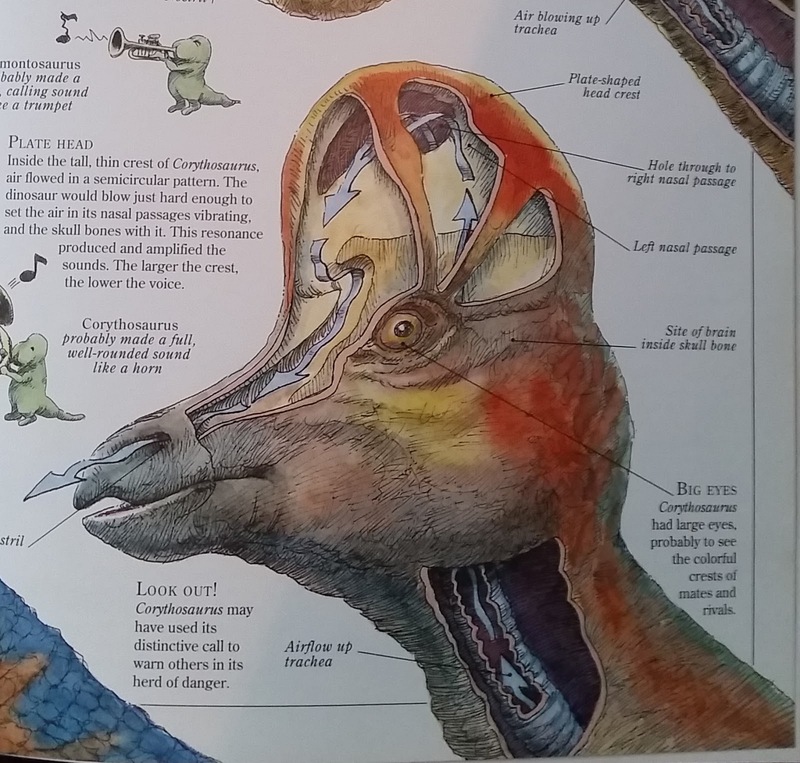 As anyone who's been there will attest, the NHM (London) doesn't seem to care a jot what hideous CG imagery it slaps on the merchandise in its tack-o-rama dinosaur shop. Notably, the same few hideous stock images appear again and again; there's a Triceratops with human molars, a bunny-handed, gorilla suit Velociraptor, a T. rex with a skull that's been through a mangle and retro JP dangly-arms, and a boringly generic wide-mouth Giganotosaurus with teeth that go all the way back. Sadly, it's the latter that's found its way onto the cover of their latest dinosaur publication - Dinosaurs: How they Lived and Evolved, by Darren Naish and Paul Barrett. Thank you, marketing twonks. Fear not though, dear reader, for this is a book that one certainly shouldn't judge by its cover. This reminds me of something from a long time ago. Hello LITC readers - Victoria Arbour signing in! 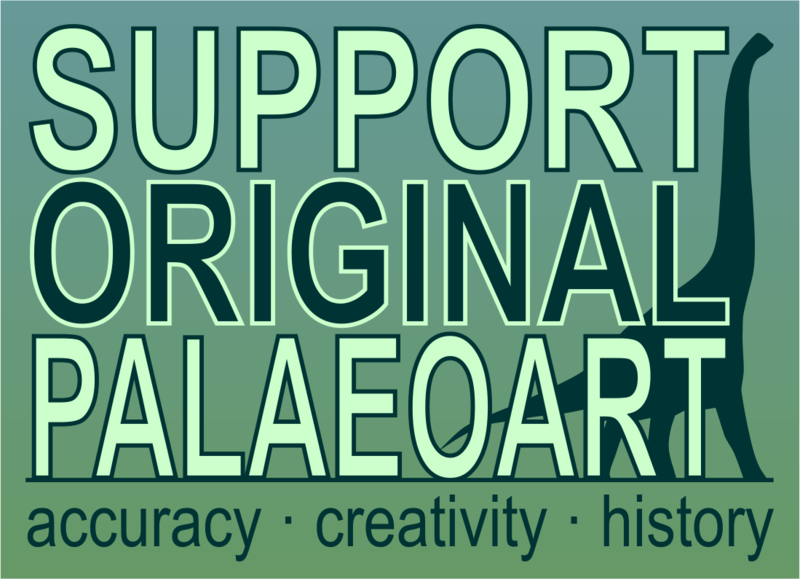 After several years of enjoying vintage dinosaur art posts as a reader myself, I’m very excited to be jumping in with my own contributions here from time to time! 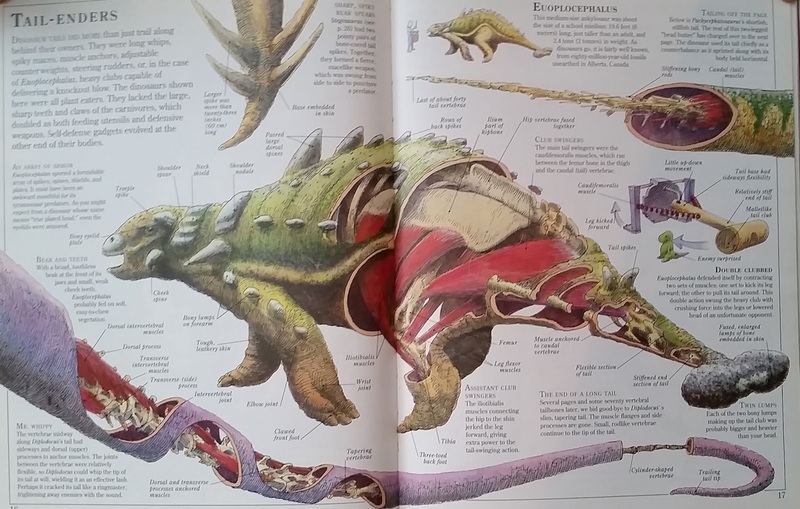 I thought I’d start with one of my very favourite dinosaur books given to me when I was 10 years old: 1993’s Inside Dinosaurs and Other Prehistoric Creatures, written by Steve Parker and illustrated by Ted Dewan, and published by Scholastic Canada. Although I’ve kept this book on my shelf through grad school and now into my postdoc, I hadn’t cracked it open in many years. 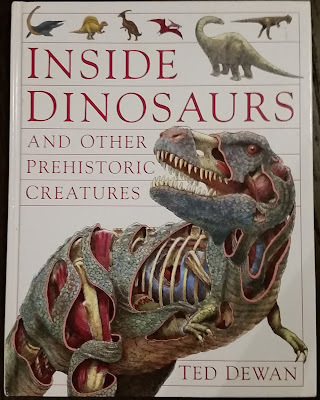 What a treat to revisit this book – a lushly illustrated, information-dense, modern take on dinosaurs that is utterly unique in its approach. I hope you’ll enjoy this sample! Inside Dinosaurs is a book about dinosaur palaeobiology and covers topics that are still receiving a lot of research interest today. 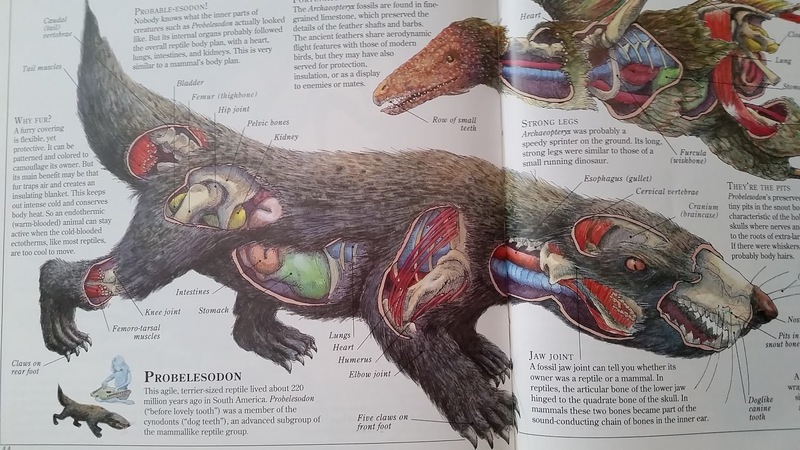 Most of the book features two-page spreads on specific topics with amazing cutaway diagrams that let you peer under the skin of dinosaurs. But first, we start with a great primer on the kinds of data that palaeontologists work with: skeletal anatomy, looking at gross anatomy and fine details, comparisons with modern animals, and dealing with missing data. And leading the charge is good old Iguanodon, a classic ‘intro to dinosaurs’ taxon if there ever was one. You’ll note throughout the book a couple of charming and quirky approaches to the presentation: many pages feature human-engineered structures as comparisons with biological structures, small green globular dinosaurs clamber all over everything, and our human-dinosaur size silhouettes are all musicians. 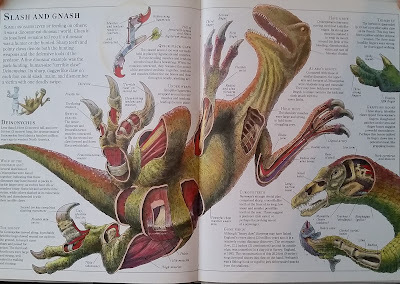 I love this rad Deinonychus, caught in a supremely dynamic leap that is marred only by the absence of feathers (forgiveable given it’s 1993 publication date). This is a great example of the kind of illustrations found throughout the book, where dinosaurs are shown in various stages of unraveling in order to showcase aspects of anatomy fitting the theme of that page. I particularly like the inclusion of the mechanical toe, and the fish-eating Baryonyx making a cameo at the bottom of the page. 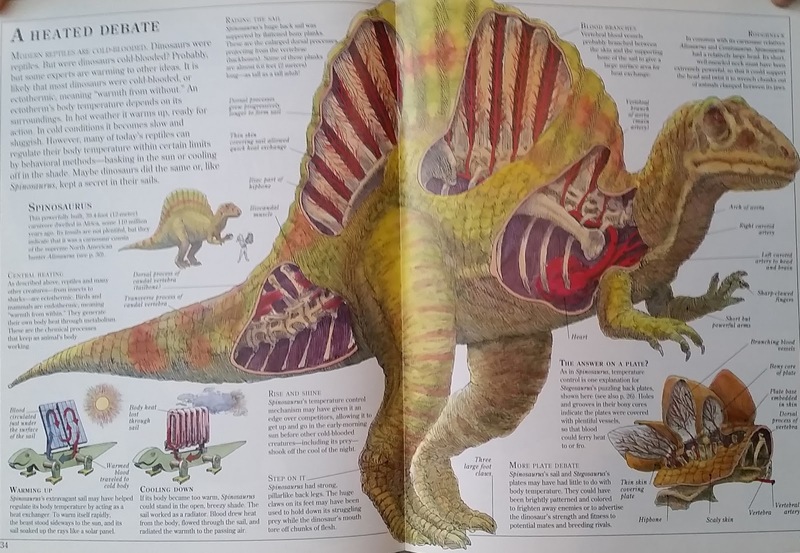 Each two-page spread features at least one large dinosaur in full view, and it’s easy to overlook the smaller diagrams that highlight interesting aspects of dinosaur anatomy. 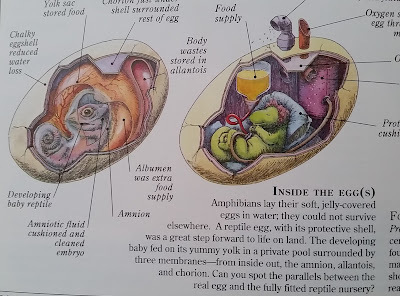 It’s one of the things that makes the book so rewarding to come back to and pore over – it’s hard not to dislike this little diagram of a Protoceratops egg and embryo. 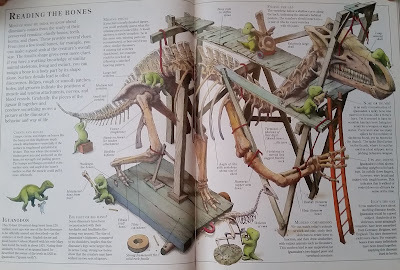 As a person who spends a lot of time thinking about ankylosaurs and animal weapons, I have to wonder if some of my interest and ideas can be traced to this particular spread. I’m pleased to note that the ankylosaurid’s tail anatomy is accurately presented: tail clubs are like mallets! I have some different ideas about how the tail muscles were arranged on the pelvis, but it’s still really cool to see this kind of detail presented in an illustrated dinosaur book for kids. We’ll come back to that sauropod tail later. The dinosaur that most shows its age in the book is Spinosaurus, shown here in full “carnosaur” garb with Allosaurus-like head, four-fingered hand, and a relatively short, stocky body. Whether or not you agree with the aquatic Spinosaurus hypothesis, this one is definitely wrong. The book also prefers the idea of ectothermic dinosaurs but notes that this idea was not universally accepted - overall, the book does a great job of exploring alternate hypotheses for all kinds of things, and also emphasizes that structures often have multiple functions that aren't mutually exclusive. True to it’s title, “Other Prehistoric Animals” that are not dinosaurs make an appearance towards the end of the book: pages about marine reptiles, pterosaurs, ancient invertebrates, and this excellent Probelesodon, a Mesozoic mammal that doesn’t exactly pop up in dinosaur books every day. 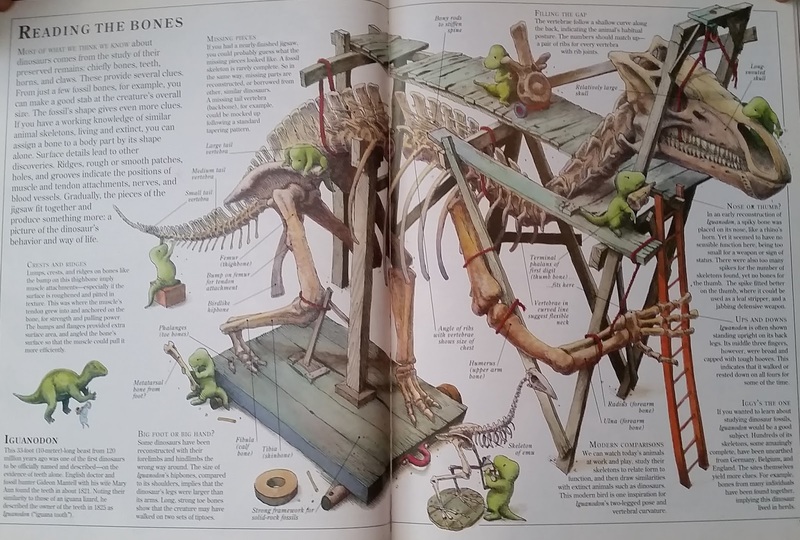 One of the most fun things in the book is the Diplodocus cutaway, with bleeds across six pages and three different topics (click to embiggen for full sauropodan glory)! We first meet Dippy in a discussion about necks, move on to a page about quadrupedality in sauropods, and finish at the tip of the tail on that page all about, well, tails! This is just a small sample of what's inside Inside Dinosaurs. It's a great book that holds up really well given its publication date, and I’d love to see an updated version done by the same author and artist and in the same style, but featuring all the new information we know today: a feathered Deinonychus, an updated Spinosaurus, all the new things we know about how dinosaurs grew, pages about dinosaur pathologies, you name it! It remains one of my favourites, and I hope you’ll check it out in person if you can. Until next time!